Fundación Pueblo (The Village Foundation) is a charity recognised under Bolivian law. We have been working for more than 20 years with and for the most disadvantaged sections of the population in Bolivia. Children and indigenous women in rural areas are the focus of our programs and projects. The Foundation works in the Yungas of La Paz, Potosí, Tarija and in El Alto. Fundación Pueblo campaigns for human rights and equal opportunities with projects at the community level. Our work has also found wide recognition beyond Bolivia. The current focus of our work is to provide access to basic education, technical education and civic information. Founders, employees, friends and supporters of the Foundation combine their social commitment with the aspiration to ensure the sustainability of programs and projects beyond our initial funding. Country and cross-cultural solidarity are the means and objectives of our work. With the “Weekly Boarding in Indigenous Families" program we give particularly disadvantaged children in the country access to a complete basic education and at the same time create socially respected employment for rural indigenous women in poor regions. 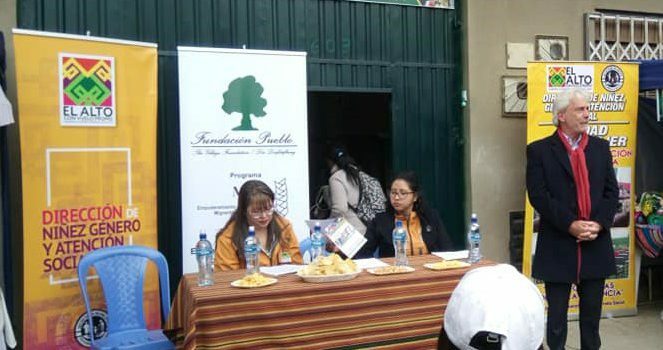 Core projects of the Fundación Pueblo are access to education, access to civic information and the promotion of women in Bolivia. The work of the Fundación Pueblo is aimed at the promotion of human rights, sustainability and international solidarity.